Q: Are the courses only for V bottom? A: No, the courses are for both V Bottom and Catamaran. We teach the techniques for all hull configurations. Q: Do I get a discount on my insurance? A: Yes, several insurance companies offer up to 10% discount to all students that graduate from our school. It also includes other insurance underwriters. They are looking for numbered certificates designating the vessel type. Q: Does the school provide a boat for me? A: No, only customer’s boats are used and you must be certified aboard your own vessel that you demonstrate all skill sets to the minimum proficiency. Insurance company does not cover unnamed drivers to personal owner’s policies. A: All over the World but we have two main locations in Florida which are Ocala FL (1.5 Hour North of Orlando) and Fort Lauderdale/Miami FL. which are held randomly. We also have courses throughout the year in almost every State including Canada and other countries. It can be done at your office, house (houseboat) or a meeting room near your location. Check out our calendar for dates and location. 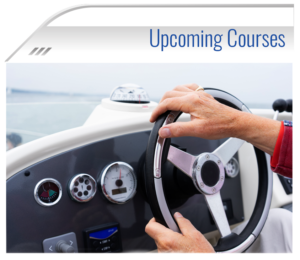 Q: I have been driving my performance boat for twenty years, why do I need this course? A: Many boat drivers are self-taught and may have picked up bad habits driving their own boats, seat times or experience is better stated as exposure. Just because you have driven your boats for many years does not make you a good driver with good skills, you may have many years of bad habits and worse is you have developed confidence in your bad habits. We teach you the correct driving skill sets for every facet of every condition while at speed. Q: Can I get one on one instruction at my own location? A: Yes you can, we do so very often. We will gladly travel to your location at your expense and teach you on your own boat and in your own house or office, we are flexible. Q: Do I get certified on any on the course? A: Yes, you do. Anything over 75MPH require certification. You must pass a written test and on water skill test. A: The classroom session may have multiple students. All on water work is done one on one. Note: expenses are divided equally amongst the number of class participant. Q: What happens if the boat breaks down during the course? A: We will evaluate all options. If time allows the instructor may remain on site at cost and attempt to complete the course. A $1000.00 reschedule fee plus actual travel expenses will apply if the instructor has to return for course completion. It’s important that your boat is well prepared to begin this course; this is the customer’s obligation. Q: What about bad weather or rain? A: We cannot control Mother Nature but we have done the course in some rain or very cold weather. If the weather does not allow we can stay on site and wait at extra expense but this very rarely happens. Q: Should I have life jackets? A: EVERYONE aboard a performance vessel should carry and wear the proper life jackets. Tres Martin’s Boat School will provide LIFELINE jackets during the course but we highly recommend you order your own for the prefect size match. We do offer 10% discount on LIFELINE Jackets to all students.